Cadillac Ranch, Near Amarillo, Texas, originally uploaded by glennia. We visited the famed Cadillac Ranch near Amarillo, Texas on our way to Oklahoma City. The tradition is to leave your mark on the old Cadillacs buried nose-down in the ground. Unfortunately, we left our spray paint at home, so we just had to take photos. 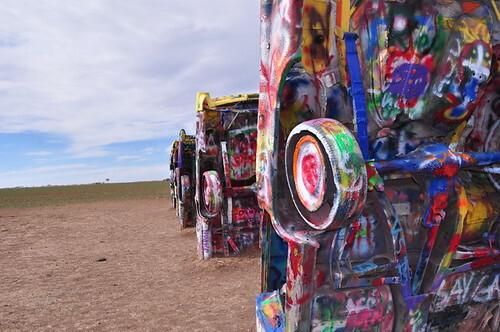 Cadillac Ranch is located on a wind-swept portion of I-40 (not Route 66) and is like the ruins of some ancient civilization dotting the landscape. I suppose it could be a pop-culture homage to the car culture of 1950's, or just a quirky Texas joke. Either way, it's quite a sight to see. I was in Houston for the Mom 2.0 Conference last month. Somehow, this picture that I took when arrived at the Four Seasons just showed up via Posterous. I guess it's been looping around in the ether all this time. I had a wonderful time in Houston, but haven't had a chance to write about it yet due to work. Maybe this is the internet's way of subtly reminding me?